by International Monetary Fund. Research Dept. The September 2011 edition of the World Economic Outlook assesses the prospects for the global economy, which is now in a dangerous new phase. Global activity has weakened and become more uneven, confidence has fallen sharply recently, and downside risks are growing. Against a backdrop of unresolved structural fragilities, a barrage of shocks hit the international economy this year, including the devastating Japanese earthquake and tsunami, unrest in some oil-producing countries, and the major financial turbulence in the euro area. Two of the forces now shaping the global economy are high and rising commodity prices and the need for many economies to address large budget deficits. Chapter 3 examines the inflationary effects of commodity price movements and the appropriate monetary policy response. Chapter 4 explores the implications of efforts by advanced economies to restore fiscal sustainability and by emerging and developing economies to tighten fiscal policy to rebuild fiscal policy room and in some cases to restrain overheating pressures. Primo Braga Carlos A.; Vincelette Gallina A. 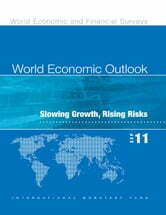 More By International Monetary Fund. Research Dept.